Niall McGinn celebrates his winner. 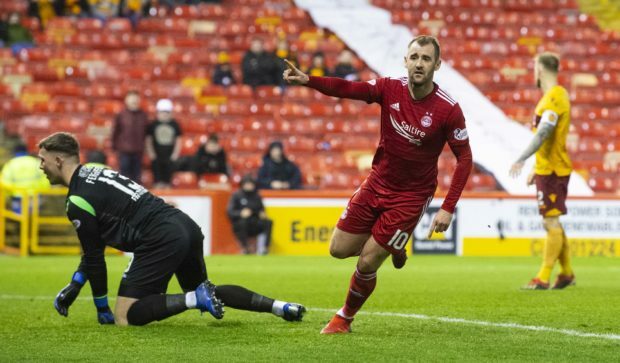 Niall McGinn’s second-half brace gave Aberdeen their first league victory at Pittodrie since December as they beat Motherwell 3-1. The Northern Ireland international settled a cagey affair with 20 minutes to go, crashing home after Greg Stewart’s shot was blocked into his path, before curling home a wonderful strike with the final kick of the game. Max Lowe’s cross-shot had given the Dons an early lead but Jake Hastie equalised at half-time, in what looked like being another nervous occasion for the hosts. However, McGinn’s goal gave the home fans something to cheer about, with their last win at home prior to tonight coming against Hearts on December 22. In the one change from the 2-1 defeat to Hearts on Saturday, Dean Campbell was given his first start at Pittodrie, coming in for Greg Stewart. 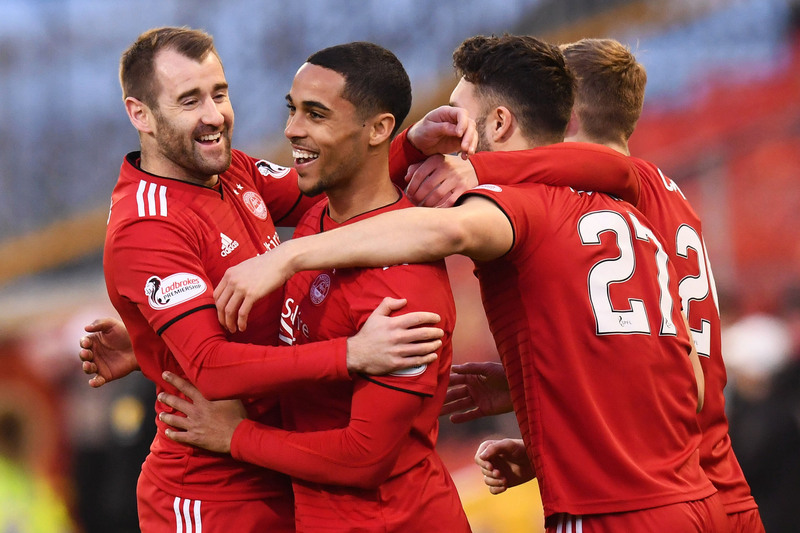 Chasing their first win at home since December, Aberdeen gave their patient home fans something to cheer inside four minutes. Max Lowe floated what appeared to be an overhit cross towards the back post, however goalkeeper Mark Gillespie misjudged the flight of the ball and was helpless to see it loop in. Derek McInnes’ side kept up the early pressure and pressed high, forcing Motherwell into a number of hasty clearances. Lewis Ferguson forced Gillespie to parry at his near post and Lowe skipped effortlessly through a flailing ‘Well defence until his strike for a second was blocked. Max Lowe celebrates his opener. Graeme Shinnie was at the heart of everything good for Aberdeen, dominating the centre of the park and it was one of his trademark bursts forward that teed up Niall McGinn, whose cross was headed wide by Sam Cosgrove. Motherwell levelled nine minutes before the break with their first meaningful effort on goal. Richard Tait was allowed to cut inside from the left and slide in Hastie, who kept his composure to round Joe Lewis and finish. The second half was poor fare as Aberdeen struggled to establish any kind of rhythm after the equaliser. The game was halted on 64 minutes after a thunderous mid-air collision between Cosgrove and Gillespie, with the Motherwell stopper down for four minutes before he was stretchered off. Substitute goalkeeper Rohan Ferguson had barely been on the pitch two minutes when the Dons were back in front, as McGinn crashed in from six yards out when Greg Stewart’s shot was blocked. Aberdeen’s Niall McGinn makes it 2-1. 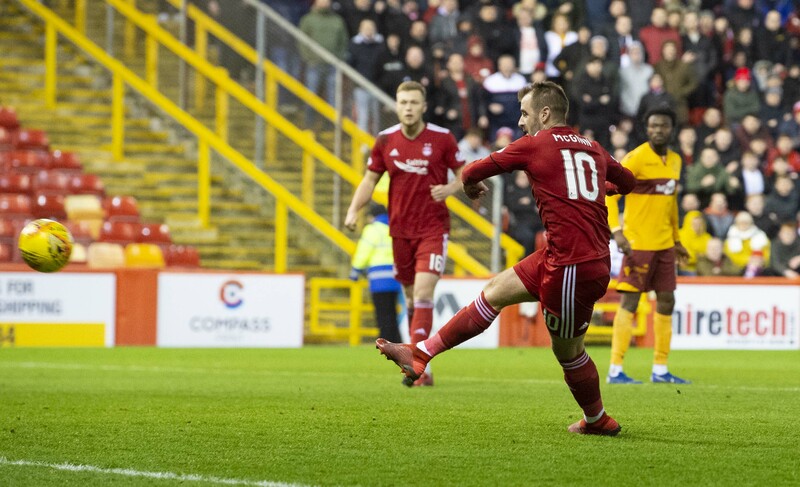 That eased the pressure on a Dons side that looked like allowing Motherwell back into the game, before McGinn added a third in the seventh minute of stoppage time with a sumptuous strike from the edge of the box.